Genesis Bonanza Bros. (USA v1.1) in 08:53.79 by SprintGod & Spikestuff. Bonanza Bros. (1991) is a shooter-platform game that was first released in the arcades and then ported to the Sega Genesis, and can be played in a cooperative 2 player mode. 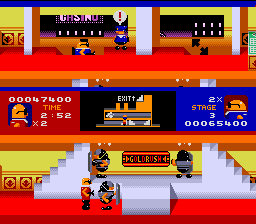 The plot involves the Bonanza Brothers: Robo and Mobo, who resemble the Blues Brothers, but are thieves who steal many treasures from banks, mansions and casinos. In this run, the authors steal as many treasures as they can and avoid the police by controlling the 2 players... at the same time! This is an improvement of 9.91 seconds over the previous movie, thanks to better optimisation.